The Accountant (2016) – Batman vs Shareholders: Dawn of Federal Income Tax Withholdings Payable – Screenkicker! I think it’s safe to say accountancy is boring. I’d even go as far to say accountants are boring. Ben Affleck’s newest film stays totally faithful to the profession by being mind-suckingly dull. That’s not to say nothing happens in the movie, loads of plot strands and characters jump in and out of the story. The problem is none of them are interesting. One tiresome, cliched, plot point comes after another until the film finally fizzles out like a damp firework in a bucket of piss. The Accountant is the story of Christian Wolff, an accountant who is apparently a high functioning autistic guy. We find this out through flashbacks to his childhood, with his relationships with family members becoming important later on. Present day Christian is still very socially uncomfortable but he’s the greatest accountant ever. The Treasury Department of the US government is after him, lead by the worst investigator in the world (seriously, at one point she uses Google Images to search for leads), because of his involvement in helping cartels and the mob with their finances. Meanwhile Christian gets caught up in a conspiracy with his new client and must bring out his action movie skills to save himself and a damsel in distress he met about two days earlier. It’s a silly story which could have been fun but it’s treated so so seriously. Affleck is good but the writing isn’t. The plot is all over the place, is filled with holes and many many coincidences and wastes a lot of talented actors. It even features, and I can’t believe I’m writing this, an accountancy montage. Imagine the training montage in Rocky but instead of Sly Stallone punching big slabs of meat, he’s writing numbers and muttering about market values. The sad part is that it’s one of the more memorable scenes in the film. So how did this happen? The Accountant is directed my Gavin O’Connor who made the excellent MMA drama Warrior which featured fantastic performances and understated story telling. Sadly O’Connor has missed the mark with this one. 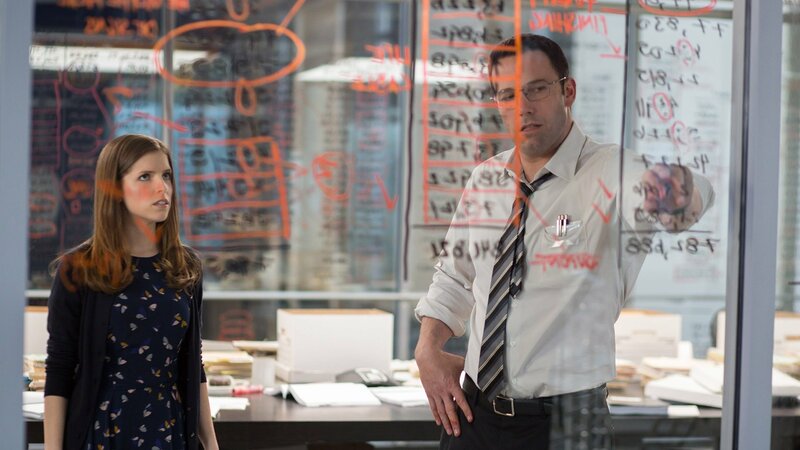 The Accountant is too long, has too many plot threads, too many characters, and has no idea what kind of movie it is. It tries to be Rain Man meets Jason Bourne but ends up being about as exciting as looking at spreadsheets for two hours. By the time the plodding narrative gets to its unoriginal ending you’ll probably be daydreaming about your overdraft. The Accountant loses interest fast so withdraw while you can (financial puns for the win!). Have you seen The Accountant? Are you an accountant? If so would you consider helping me with my finances for free? That line about accountants being boring was just a joke. Please help me. Nice to see the Screenkicker Index make a return! Ha-ha thanks mate, it’s the only part I ever put any effort into! He had made some shockers. I hated Paycheck too. Hey Mikey, nice new look of the blog, man! Ahah, love the caption, very entertaining! Yeah, WARRIOR is definitely a far better movie! Yeah, this movie didn’t do much for me either. I was especially shocked at how bad Affleck was. Its like he looked up autism on wikipedia and went from there. I have worked with many people on the spectrum, and not one of them are as robotic and bland as Affleck is here. In fact, I can’t remember much of the story, all I can remember is how bad he was!! Ha I enjoyed this one! Thought it was simple, no frills. But maybe it was really just boring. Funny, though, to think about which marginalized groups find support in Hollywood and which don’t. Thanks for the comment Alina! I think Hollywood latches onto whatever it thinks are trends. I don’t know enough about autism to comment on the accuracy of the film, but I don’t think it makes you amazing at fighting!